Family issues of addiction, mental health, domestic violence and/or sexual abuse cause devastating and long-term effects that impact children emotionally, socially, developmentally and academically. Children who experience abuse and/or neglect are at much higher risk for poor academic achievement, mental health disorders, drug abuse and criminal activities. Since 2012 the opiate/heroin epidemic has caused an increase in child abuse and/or neglect cases and at-risk children served by social service agencies. It is essential to reduce the stress, chaos and trauma to these children by funding enrichment, educational and developmental activities. The agencies through which Hope for Kids funds the needs of children do not have monies for such programs. CPS is responsible for investigating every allegation of abuse neglect and dependency, they must make reasonable efforts to prevent the removal of children from their homes, accept custody of children from courts with juvenile jurisdiction, provide temporary emergency shelter when necessary, find family foster homes for children, implement a system for assessing risk to children and administer federal adoption assistance funds. 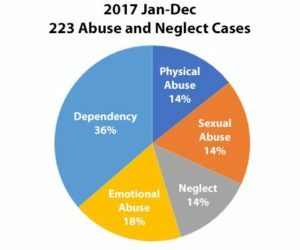 In 2017 505 investigations were completed with 223 or 44% being cases of abuse, neglect or dependency. 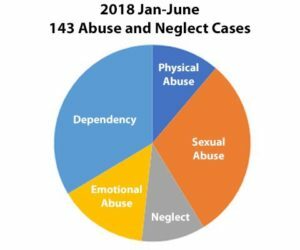 January through June of 2018 has seen an increase in the number of abuse and neglect investigations, 309 investigations were completed with 143 or 46% being cases of abuse, neglect or dependency. A report of child abuse is made every 10 seconds! Every year 3.6 million referrals are made to child protection agencies in the US, involving nearly 7 million children. Of children who are maltreated or abused nearly 75% are neglected and about 18% are physically abused, approximately 8.4% are sexually abused, with many children suffering multiple types of maltreatment. As many as 80% of 21-year-olds who reported childhood abuse met the criteria for at least one type of psychological disorder. 2/3 of people being treated for drug abuse report that they were abused or neglected as children. Children who experience abuse and neglect are 9 times more likely to be involved in criminal activities. Financial impacts of child abuse related to lost worker productivity, health care costs, special education costs, child welfare expenditures, and criminal justice expenditures add up to billions of dollars each year.